Been awile since i posted due to pressing deadlines (what's knew?). 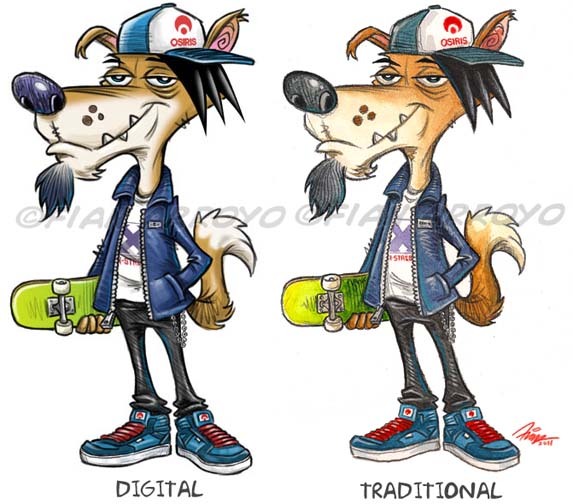 Here's a comparison in a character I did for the game Skateboard Madness done digitally and a version I did for kicks the old fashioned way with pencil and watercolor. It felt weird painting with a brush and paint instead of a digital pen, but it also felt like being reunited with an old dear friend. Took awhile to realize there was no undo command when I painted.I will have to keep doing these painting refresher courses up...Waddayathink?